Don’t let anyone tell you otherwise. Being a critic-proof success always trumps being an acclaimed flop. ABC’s Full House went completely Emmy-less while its cast became rich and famous. 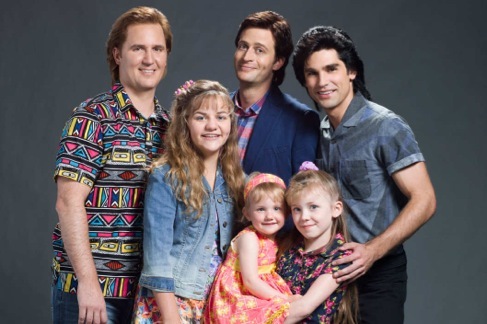 And now here comes Lifetime’s suitably innocuous The Unauthorized Full House Story. It premieres on Saturday, Aug. 22nd at 7 p.m. (central) as the filler before Netflix’s upcoming Fuller House reboot, which will reunite all of the original cast members except the opting out Olsen twins. Premiering in 1987 and running for eight seasons and 192 episodes on ABC, Full House virtually birthed Mary-Kate and Ashley Olsen while also providing very gainful employment for Bob Saget, John Stamos, David Coulier and assorted co-stars. Saget’s the driving force of the Lifetime movie. Played fairly capably by Garrett Brawith, he’s initially a sardonic standup comic who works blue, considers himself an artiste and compromises himself only after learning that his wife, Sherri (Juliana Wimbles), is pregnant with their first child. After getting fired for ad libbing too much on another failed CBS morning show, Saget is encouraged to give Full House a shot. But he yields after the actor originally cast as Danny is seen as good but not great by Full House creator Jeff Franklin (Matthew Kevin Anderson). This leads to Saget’s best line after the show is shredded by critics, with even People magazine giving it a D+. “That’s my show,” he commiserates with Sherri. “A hot, steaming slice of yummy crap pie.” Delicious. Coulier (Justin Mader) is excited about joining the cast of Saturday Night Live until he’s crushed by the show’s decision to dump him before he starts. Not only that, he has a flatulence problem that’s revisited throughout the movie. So yes, they end up forming an unlikely Full House trio, with Saget constantly carping and threatening to quit in the early going while Stamos and Coulier urge him to stay for the sake of all their careers. But of course he stuck it out, getting the host job on America’s Funniest Home Videos in the bargain while Stamos played the field and Coulier kept farting before, during and after a failed marriage. “Dude, you’ve been on more hot women than sun block,” Saget tells Stamos just before he begins dating Paula Abdul for a minute or so. The revelry and ribaldry eventually give away to an abundance of sappiness, much of it involving Stamos. But Saget first gets a last hurrah by messing around with a mannequin on the Full House set after envisioning himself as host of “America’s Favorite Sexual Positions.” His impressionable young co-stars see some of this, prompting producer Franklin to blow up and order Saget to “get it together.” Alas, he then pretty much does. Down the stretch, Stamos becomes a fatherly mentor to the easily hurt Candace Cameron (Shelby Armstrong/Brittney Wilson), who played Donna Jo “D.J.” Tanner throughout the show’s run. Everyone ends up heartbroken when ABC finally cancels Full House, with Saget getting full-circle squishy during a cast reunion two years later at Candace’s wedding. A few nice turns by Brawith as Saget aren’t enough to make The Unauthorized Full House Movie more than a connect-the-dots, dish-a-little-dirt, spoon-a-little-sugar, cut-print diversion. Still, it’s nowhere near a desecration, giving fans of the series a basically harmless glimpse at how the thing came together and somehow stayed together. A-w-w-w-wesome. Now on to Fuller House.